Fits very well, although the size ran a little on the large size. The comfort fit sizing seems to run large in general. Nonetheless, very comfortable and palladium is gorgeous. 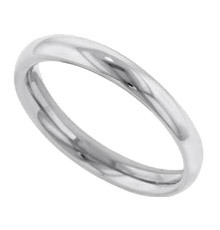 This is a classic 3 mm palladium half round tapered wedding band. The band is designed with a curved inside edge for optimal comfort. This band can be worn alone or as a wonderful complement to most engagement rings.